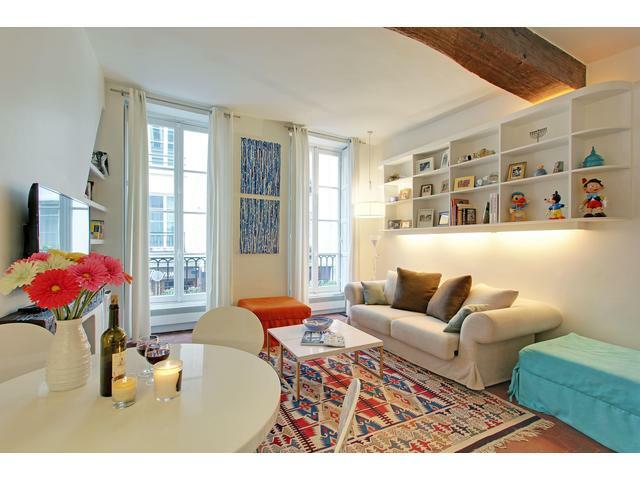 This elegant two bedrooms apartment is perfectly located on the quiet Rue Guisarde, in Saint Germain des Prés, 6th arrondissement. It is 10 minutes away from the Place Saint Sulpice, The Luxembourg Gardens, and the Place Saint Germain des Prés. On the 4th floor with an elevator from half floor up to 4 and a half floor, it features two bedrooms, thus perfect for a family or group of friends. This duplex apartment of about 60 square meters (about 646 sq ft) features a living room, dining room, toilet, and kitchen on the main floor. The living room has a couch, a decorative fireplace, coffee tables, two armchairs, books, and two windows. The dining area features a glass table for four, a window, and another smaller decorative fireplace. The kitchen is fully equipped with a fridge, microwave, stove, dishwasher, and coffee maker. The two bedrooms and the bathroom are located on the above floor, which can be accessed from the spiral wooden staircase in the living room. The first bedroom is situated in the same room as the staircase. It includes a double bed (140x190 centimeters), two windows, and a large dressing. The second bedroom has a double bed (140x190 centimeters), one window, and dressings. The bathroom features a sink, shower, and toilet. The metro station Mabillon is only 2 min away where you can travel throughout Paris. Enjoy a cup of coffee at the Famous Café des 2 Magots, or Café de Flore, and enjoy the view of the Saint Germain des Prés Church. Rue du four is famous for its refined shopping store. Rue de Buci is 5 minutes away with its restaurants, cafés, and commodities. This area is also famous for its art galleries and great ambiance. Perfect location! 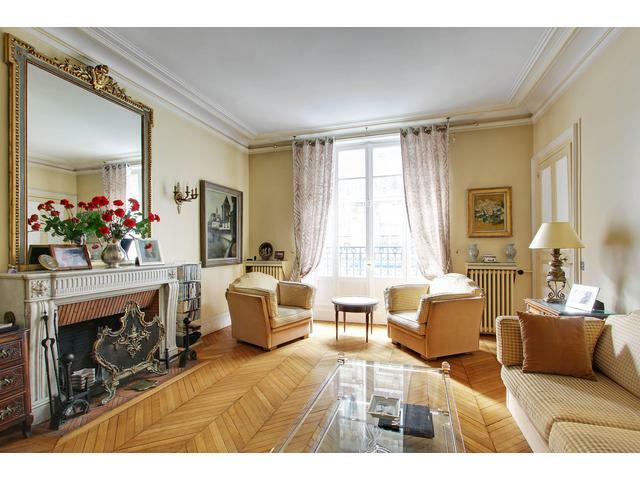 This is a very charming one bedroom apartment located Rue Saint Jacques, in the 5th arrondissement, close to the Luxembourg gardens and the Panthéon. On the first floor (ground floor + 1) without an elevator of a Parisian 18th century building, there is a beautiful view on a green garden. It can accommodate 4 guests. Perfect for a stay with friends or family ! This apartment of about 47 sq meters (or 505.90 ft²) features a cosy and peaceful living room with a convertible sofa that opens into a comfortable double bed with a real mattress (140x200cm), and three large windows with a clear view. Furniture includes a wooden coffee table, two armchairs, many books, plants, stereo, printer. Have a lovely time in the dining area, where you can enjoy meals on a wooden table with four chairs. Amenities include TV with several international channels and internet in Wi-Fi. The separate kitchen is fully equipped with freezer, dishwasher, washer, induction cooktops, oven, microwave, coffee machine, kettle, toaster, fridge freezer, and every utensils you need to cook. The separate bedroom features a double bed (140x200 centimeters), a wooden wardrobe, large closets and a window with a view without any facing neighbour. The bathroom includes a sink, bathtub with showerhead and toilet. 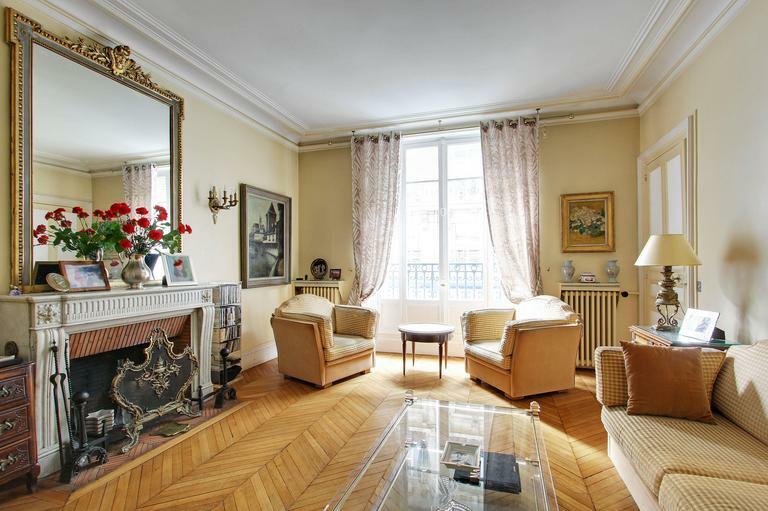 This comfortable one bedroom apartment is perfectly located in the 5th arrondissement, the oldest arrondissement of Paris. In the heart of the Latin Quarter, and the Sorbonne, the rue Saint Jacques is probably one of the oldest streets of Paris too ! You will find many restaurants, two pharmacies, two markets with fresh fruits and vegetables, banks, coffees, a chocolatier, wine merchant and more on and around the street. This apartment is at a walking distance to many attractions in Paris: Beautiful Luxembourg Gardens (4 min), Place Saint Germain des Prés (20 min), Pantheon (4 min), Saint Sulpice Church (15 min), Place Saint Michel (10 min), Odeon (10 min), Marché Saint Germain (10 min), Louvre Museum (30 min), Notre Dame Cathedral (15 min), and the famous fresh market of the Rue Mouffetard (10 min). 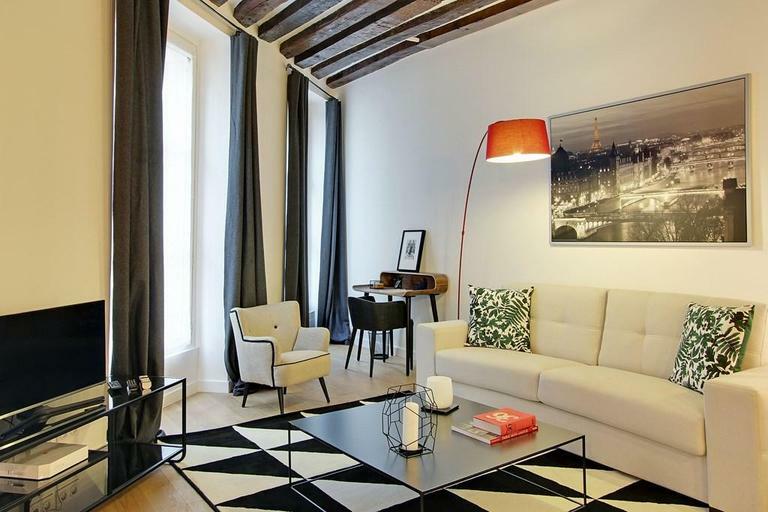 This apartment is perfect to enjoy a peaceful stay in Paris. The building is beautiful and safe with an entry system. It is perfectly located to live as a real Parisian. 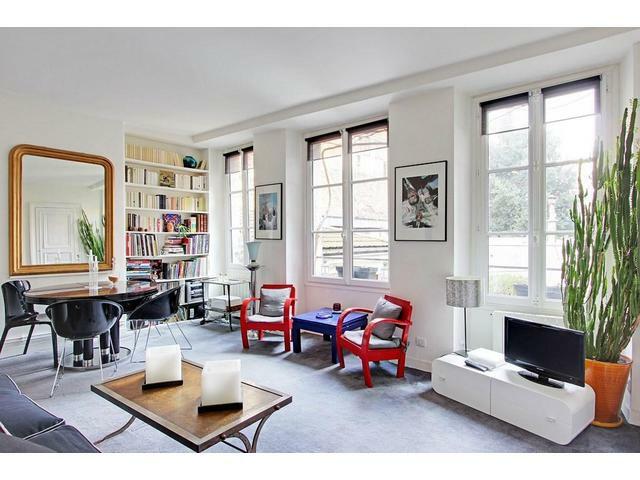 This elegant three bedrooms apartment is very well located in the safe Saint Germain des Prés area, in the 6th arrondissement. It is situated on rue des Beaux-Arts a quiet street 4 min walk from the Seine River and 2 min from the lively rue de Buci with its coffees, restaurants, bakeries and its supermarket which leads to the heart of Saint-Michel. The apartment is on the 1st floor (ground floor + 1) with an elevator, it is a crossing apartment so very luminous, on the street and on a green courtyard with an unobstructed view. It has a refined decoration with beautiful antique furniture, a high ceiling, large windows, wooden floor and many boards. It is perfect for a family stay or with friends ! This apartment can accommodate 8 guests. This apartment of 130 sq meters, or about 1399 sq ft, features an entrance hall which provides access to the kitchen, the two bathrooms, three bedrooms and the spacious living room that features three large windows, two sofa and one comfortable couch that converts into a queen size bed (160x200cm), a coffee table, a beautiful old chest of drawers, a TV with international channels and DVD player, a dining area with a dining table for 8. The high ceiling with its typical Parisian molding, the elegant decoration and the wooden floor will make you feel cozy and at home. The kitchen is separate and includes a large window, fridge, microwave, washer/dryer, dishwasher, stove, oven, coffee maker, toaster, boiler and all utensils to cook. It also features a dining table for two. Wi-Fi is available in the apartment. The main bedroom on the other side of the apartment is on the courtyard and includes two large windows, a high queen size bed (160x200), a closet, two chairs, two bedside tables and a wooden shelf. The second bedroom is on the courtyard and features two separated beds (90x200), a wooden wardrobe, two bedside tables, a wooden desk and a large window. The third bedroom is on the street side and has a queen size bed (160x200), a closet and a large window. The bathroom features a sink, a bathtub and toilet, the second bathroom has a shower, sink and toilet. The apartment is on the 1st floor with an elevator of a building dating from 1800 with a charming green courtyard. It is perfectly located on rue des Beaux-Arts that gets its name from the famous National School of Fine Arts located at the end of the street. You will find yourself nestled in a haven of calm, a few minutes away from shops and all commodities. You are also at a walking distance to many attractions in Paris such as Place Saint Germain des Prés, the Seine River banks with its bouquinistes, Saint Sulpice Church, Delacroix-Furstenberg museum, Place Saint Michel and the the Latin Quarter, the Louvre Museum, the Tuileries Gardens, Quai d’Orsay, Luxembourg gardens and many others… The closest metro stations : Saint-Germain des Prés line 4 and Mabillon line 10, are 6 min away which makes it very easy to travel through Paris, and you thus have many buses. It is the perfect apartment for a family or group of friends who wishes to have a pleasant stay and discover the heart of Paris in a privileged place. This beautiful and cozy one bedroom apartment is located right in the heart of Saint-Germain-des-Prés, in the 6th arrondissement of Paris. 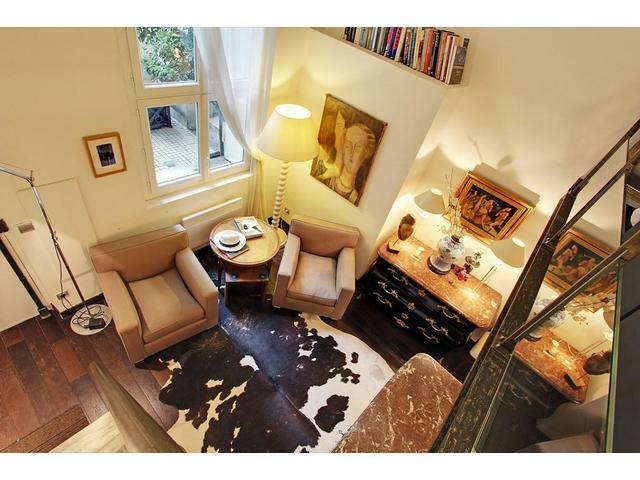 Situated on the lively Rue Dauphine, it is 1 min away from rue de Buci. Just fully renovated, you will love the stylish furniture and decoration. This apartment of about 50 square meters (or approx. 538sq ft) features an inviting living room, kept in white-grey-red color set. With three large windows on the street side, it is luminous and will make you feel at home. Furniture includes a high-quality convertible sofa that opens into a double bed, a coffee table, an armchair, a small working desk with a chair, a bookshelf, a side table and a cable TV with several international channels and internet in Wi-Fi. In the opposite corner of the living room you will find a dining space, with a dining table for four. The wooden floors, well-chosen decorations and exposed stone walls on one side give a modern and minimalistic yet very stylish look. The fully renovated open kitchen is connected to the living room. The kitchen includes an oven, induction cooktops, washing machine, microwave, coffee maker, kettle, toaster, fridge and freezer. The large working table paired up with three bar stools gives an additional sitting space that will allow you to enjoy cooking or just spending time with your family and friends. In the quiet bedroom you will find a comfortable queen size bed with large mirror above, two bedside tables with lamps and a mirrored chest of drawers. The whole right wall is entirely taken by in-wall closet, offering plenty of space for your belongings. A window is on the court side, ensuring quiet rest. The bedroom design is kept in-sync with living room decorations which gives a peaceful and organized appearance to the whole apartment. The bathroom, featuring a shower, sink, two drawers, hairdryer and a towel heater, can be accessed from the entrance hall. Right next to it is the separate toilet room. The apartment is on the 2nd floor without an elevator of an old building at rue Dauphine, the road dating back to XVII century. It is a lively street that starts from the Carrefour Buci and leads to the Quai des Grands-Augustins and the Seine banks. You will be in the middle of Saint-Germain-des-Près area, with many restaurants, brasseries, shops, art galleries, cafés, bakeries, movie theaters... One of the best areas in Paris to live as a Parisian. The apartment is at a walking distance to many attractions in Paris: 5 min to the Seine River with boat cruises and Ile de la Cité, 5 min to Saint-Michel and the Latin Quarter, 15 min to Notre Dame Cathedral, 10 min to Place Saint Sulpice with the beautiful Saint Sulpice Church, 35 min to the Eiffel Tower, and 15 min to the Luxembourg Gardens. It is also next to Odéon subway station lines 4 and 10. It is also 10min away from Saint-Michel station line 4 and from Saint-Michel-Notre-Dame RER B and C.
Perfect Location if you want a cozy stay in a lively area. 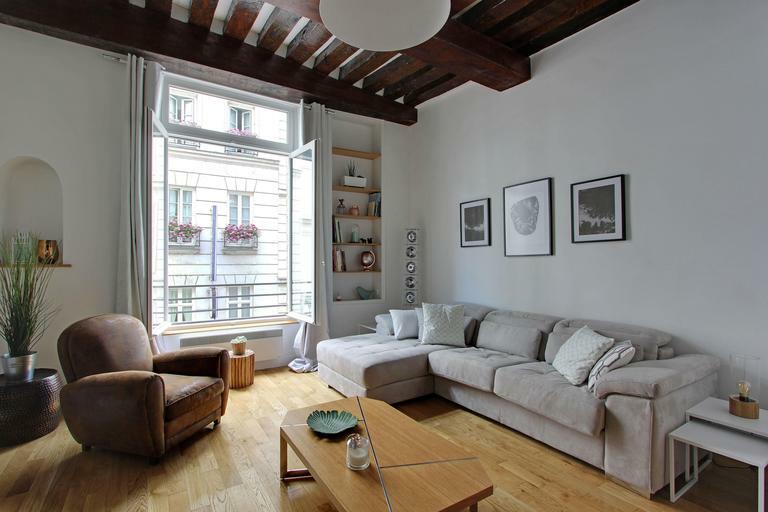 This distinctive 2 bedrooms apartment in duplex that can sleep 3 people is a great place for a family or small group of friends looking for a place in Paris! Located on the famous Boulevard Saint Germain, at Odéon, it is on the ground floor of the beautiful XIX-century building, in the heart of 6th arrondissement. The decoration is very eclectic and interesting, giving the place a unique atmosphere. You will find a mix of paintings of different modern styles and antique pieces. The apartment is very high (3.76 m or 12’4 feet), with the mezzanine over kitchen area. This apartment of 50 square meters (or 538 square feet) features a cosy living room with kitchen, a bedroom on the mezzanine and second small bedroom. The living room, with a large window facing the inside court, is equipped with a coffee table with two comfortable armchairs, two decorative chests of drawers and large dining table for 4 people. The open-plan kitchen (ceiling: 1.93 m or 6’3 feet high) offers microwave/oven, a fridge with a freezer, washing machine, sink, coffee machine, dishwasher and induction hob. You will also find all the appliances you may need for cooking. The stairs in the living room lead to the master bedroom on the mezzanine (ceiling: 1.83 m or 6 feet high) with a king bed (190x200 cm), two bedside tables and two lamps, two armchairs and a bookcase. It is decorated with painting in cubism style and retro photos. The second bedroom can be found downstairs: it has a single bed (95x200cm), a TV with a choice of French and international channels, Wifi, a phone, three armchairs and two large cupboards. this room leads to the bathroom, where you will find the shower, sink with sink cabinet and space for your belongings. A large window facing the court is covered with curtain and the toilet is separate. The apartment is situated next to Odéon metro station from where you can easily explore Paris. Find the oldest Parisian coffee place, Procope Café, just behind the corner. This restaurant was created in 1686 by Francesco Procopio Del Coltelli, and it was famous for its meetings in literature. It became the first “café litteraire” in Paris. De La Fontaine, Voltaire, Rousseau, Beaumarchais, Balzac, Hugo, Verlaine, and many others, were recurring customers of the Procope. 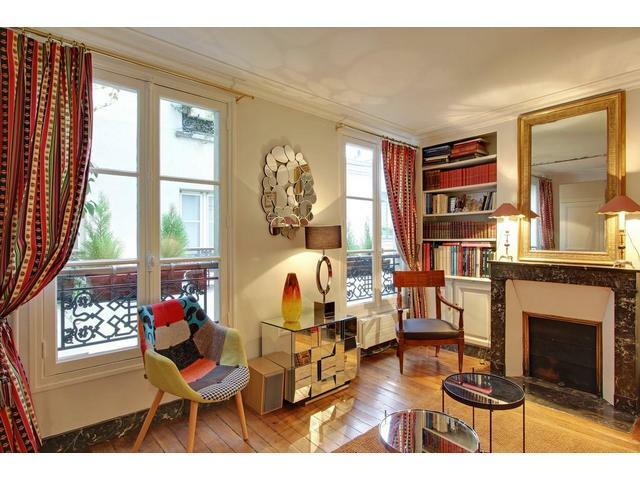 This authentic Parisian apartment is located on rue Coetlogon, in the 6th arrondissement, next to rue de Rennes and elegant boulevard Raspail. Located on the 1st floor with elevator, it features two bedrooms, each with a private bathroom, a living room, a dining room, an equipped kitchen, and a toilet room. 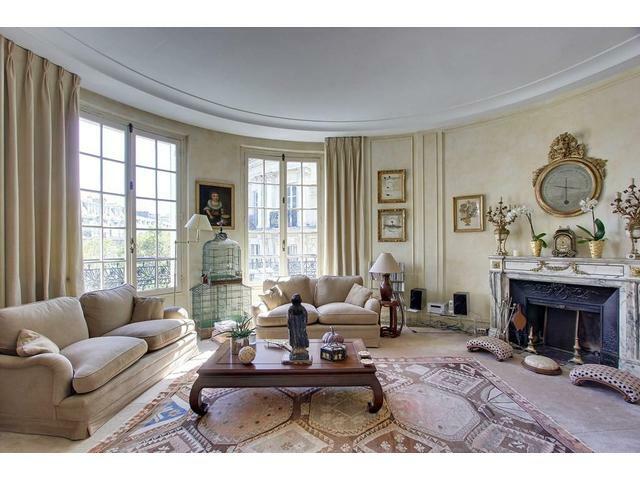 It is very elegant, decorated in characteristic classic French style with grand windows and stylish details. It can sleep 4 people. Perfect for two couples or a family! This spacious apartment of 110 m2 (about 1184 square feet) is a rare example of vintage French design. First you will see an entrance corridor, with wooden antique clock, beautiful chandelier and a mirror with shelve where you can put your keys or trinkets. The corridor leads to a comfortable living room, furnished with a couch and two armchairs, a beautiful chest of drawers, a coffee table, second small table and TV with international channels. Free internet in Wi-Fi is provided. The room is kept in warm colors, with wooden floors, beautiful paintings, decorative fireplace with large mirror, and many souvenirs. A large window provides a lot of light. A dining room, located between the living room and the entry hall, features a large table with chairs for 6 people, a decorative fireplace, a piano, a cupboard and a large mirror. The window faces a quiet inside court. The separate kitchen, located on the other side of the corridor, is fully equipped with a fridge and freezer, an oven, an induction cooktops, a microwave, a kettle, a coffee machine and a toaster. It also has all the dishware and amenities needed to prepare and enjoy a delicious home-made meal. The first bedroom is accessible from the entrance and features a double bed (140x190cm), a bedside table with lamp, couple of wall shelves and 2 cupboards. The room is decorated with a chimney with large ornamental mirror and a modern painting. A big window faces a quiet street, and it can be covered with curtains and metal blinds. The bedroom has an access to a private bathroom, which features a bath tub with shower head, a grab handle on the wall, a sink, a mirror and a heater. Just like the rest of the apartment, the bedroom is elegant and has an authentic Parisian vibe. The second bedroom can be accessed by the living room, and it includes a double bed (140x190cm), two bedside tables with lamps, two comfortable armchairs, a table with a chair, that can be used as an office space, and a wooden wardrobe closet. There is also a decorative fireplace with gold-framed mirror, a chandelier, wooden floors and beautiful paintings on the walls. A large window overlooks a calm rue Coetlogon, and it can be covered with blinds and curtains. The bedroom gives access to a second private bathroom, with big shower cabin featuring rainforest shower, a foldable wall-chair and grab handles. There is a sink, an elegant silver-framed mirror, a towel heater and a small window as well. Between the second bedroom and the dining room you will also find a wardrobe room with closet space, where you can store your belongings, including your suitcases. This room also features a washing machine, and a drying rack, so you can dry your clothes there without sacrificing any habitable space. A separate toilet room can be conveniently accessed from the entrance corridor, and it features a toilet and a small sink. The apartment is located in a charming building from the end of XIX-century, on a quiet street situated between rue de Rennes and rue d’Assas. Take rue de Mézières and reach stylish Place Saint-Sulpice. From here you are only moments away from Jardin Luxembourg. You will be in one of the best places to experience a real Parisian lifestyle and visit many Paris attractions! Nearby stations: Sevrès-Babylone, Rennes or Saint-Sulpice, and take a metro to wherever you wish to go! An ideal apartment to live like a Parisian! 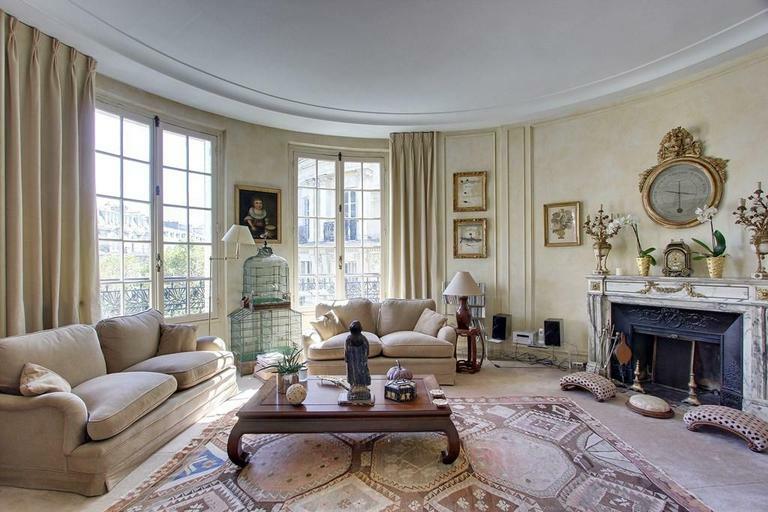 This luminous apartment is ideally located on lively Rue Dauphine, in Saint Germain des Prés, 6th arrondissement. On the 2nd floor without an elevator of a lovely building, it features a spacious living room with high ceiling, a mix of modern decoration and authentic Parisian charm, and a bedroom. It can accommodate up to 4 guests (3 adults or 2 adults and 2 children). The apartment was recently renovated. This stylish loft of about 55 square meters (or about 592 square feet) features an elegant living room with a convertible sofa bed that opens into a small and short double bed (120x170cm) suitable for 2 children or 1 adult, a wardrobe, cupboards, an artistic coffee table made out of wood and metal, two other small tables. There is also TV and unlimited internet in Wi-Fi. The room is decorated with characteristic wooden beams, plants and mix of wood, gray and white. Due to a very high ceiling and its design, the apartments feels bigger than it is. A large window faces charming rue Dauphine. An open-plan kitchen is located in the living room. It features a fridge with freezer, microwave, oven, coffee machine, kettle, toaster, kitchen hood, a washing machine (no dryer) and all the dishware and cutlery needed for daily cooking. The bedroom with a queen-size bed (160x200cm) can be accessed by taking four steps up. The bedroom space features a bedside table with lamp, and another elevated space before a window (facing inside court) which can be used for your convenience. It is perfectly coordinated with the living room, creating a feeling of harmony. The bathroom can be accessed from the bedroom, and it is separated by dimmed glass walls and sliding doors. It features an Italian shower with rainforest shower, a mirror, a sink with cupboard, a toilet and a towel heater. 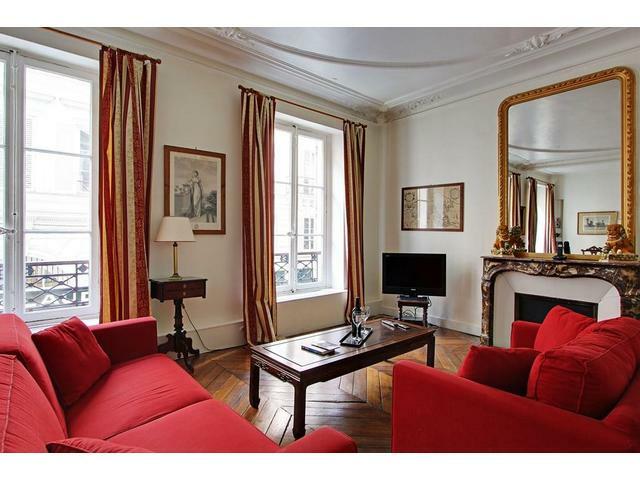 The apartment is situated in an authentic Parisian building on Rue Dauphine. It is a lively street that starts from the Carrefour Buci and leads to the Quai des Grands-Augustins and the Seine banks. You will be in the middle of Saint-Germain des Pres area, with many restaurants, brasseries, shops, art galleries, cafés, bakeries, movie theaters... One of the best areas in Paris to live as a Parisian. Perfect stylish place for your holidays in Paris!